Head shot taken when I started at AHA. A shorter version of this story appeared on the Huffington Post. Click here to read it. Nov. 2, 2015 -- Five weeks ago today, I did something for the first time. I ran an entire mile – four straight laps around a track without stopping. While it’s possible that I was forced to go that far in a P.E. class, it’s just as possible that I didn’t make it. Or that I fibbed about how many laps I’d done and coaches let it slide, knowing how long another loop would’ve taken. I spent most of my adult life avoiding running whenever possible. If nobody’s chasing you, why bother? Yet on Monday, Sept. 28, I ran a mile. And another. The next week, I ran eight miles … per day on Monday, Wednesday and Friday. At the end of the following week, I signed up for the Dallas Running Club’s Half Marathon. I even joined the club. 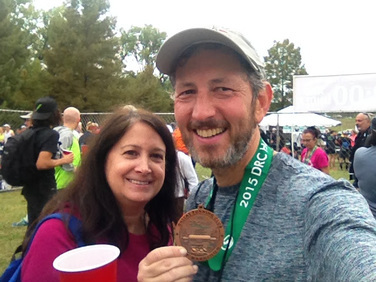 And yesterday – on the final day of my 44th year – I ran those 13.1 miles, finishing in 2 hours, 16 minutes, 32.1 seconds. Clearly, this was more than a whim, far more than tapping some unknown potential. Becoming a runner is the latest phase in my journey from fatness to fitness. In less than two years, I’ve dropped 52 pounds. I’ve plunged from size-38 pants to 30s, from favoring XXL T-shirts to fitting into mediums. My story is not unique. Lots of people lose 50-plus pounds and lots go from non-runner to half-marathoner. Surely I'm among plenty of people who do both. Still, my story is uniquely mine. This is that story, spooled out in a series of anecdotes from my ridiculous start of walking in place on a personal trampoline to the unforgettable burst of adrenaline and emotion as I crossed the finish line Sunday. In April 2012 – about five months after I left sports writing to become a writer for the national headquarters of the American Heart Association – my office held its annual Health Fair. You received a raffle ticket for every booth visited, so I hit them all. I heard sales pitches for everything from personal trainers (to get you healthy) to estate planners (in case you didn't). I also learned all my key numbers, including weight. I blobbed in at 186 pounds, way too much for my 5-foot-5½ frame. When the Heath Fair came around in 2013, I'd slimmed down. All the way to 183. I celebrated by gaining it back and more. I don’t know specifics, just that my easy-fit size-38s were getting tight. Around my 43rd birthday, I decided enough was enough. I didn’t know what to do or how to do it, but I was going to turn things around. In retrospect, my best decision was realizing that it took me 43 years to get this way and recognizing that it would take a long time to get out of it. That meant doing things at a slow, steady and sustainable pace. This was November 2013, and fitness trackers were becoming all the rage. I bought a Fitbit Force and the name was perfect. Seeing that dang thing on my wrist forced me to get moving. Yet I launched this voyage in the winter. Since it was cold and dark when I got off work, how was I going to get in my 10,000 steps? That’s when I dusted off the “rebounder,” a small trampoline-like thing without any bounce. My routine of walking in place on the rebounder felt as dumb as it sounds. At least, until my Fitbit buzzed, acknowledging my 10,000th step. As the weather improved, so did my routine. I walked our dog or made longer, solo walks at the high school track nearby. I also began taking advantage of the treadmill desk at work. Soon it was time for another Health Fair. I weighed in at 172. The following months brought more bursts of progress. I created my own treadmill desk. I bought a decent machine from Amazon, then went to Lowe's and got two orange bungee cords and a $3 piece of plywood trimmed to the size I needed. I began weekly weigh-ins at home. Like the step-tracking of the Fitbit, it was another layer of accountability. In October, I was in Atlanta with my favorite sportswriter, Jake Aron of SIKids.com. He was covering a golf tournament at a fancy country club and I'd underestimated the strictness of their dress code. In other words, I hadn't packed any slacks. So I bought a pair. In my new size: 34. On my 44th birthday, I weighed 157 pounds. I celebrated a few weeks later by entering the Turkey Trot on Thanksgiving. Of course, I opted for the 8-mile walk, avoiding the 5K run. As of May, I was in a rut. My weight had plateaued in the mid-150s. To shake things up, I decided to hit the high school track around 6:30 every morning. That would let me beat the heat and have plenty of time for a long walk. Hitting 10,000 steps seemed easy. Needing a new target, I remembered the Turkey Trot being eight miles. So that became my daily goal. About three weeks in, I decided to try running a lap. Soon, I was running a lap per mile. Well, one lap per mile over eight miles comes out to eight laps – or, two miles. But since they were so spread out, it never really felt like it. His question resonated for days. Could I now be considered a runner? I mean, I still couldn’t say that I liked running. To borrow and twist a phrase from Dorothy Parker, I hated running, but I loved having run. Both had the same answer: Diet. Not some fad plan, but scrutinizing everything they ate. They weren’t starving. They were simply eating the right amount of the right foods. This was a game-changer. They’d each lost more weight than me, in less time, strictly by eating right. While I’d improved my diet throughout my health kick – I make a mean fruit smoothie – clearly I hadn’t done enough. Between running more and eating better, pounds of fat burned away. I’d just broken into the 130s when I bumped into a neighbor who likes running. I mentioned that I hadn’t seen him at the track lately. He said he's out more often when training for an event, like a half-marathon. “You should do one,” he said. “Sure you can,” he said. That was Thursday, Sept. 24. And I had yet to run an entire mile at once. I gave it a try the following Monday. I played with different distances for the rest of the week, unsure of what I could do or should do. Lacking a game plan, I relied on my same arbitrary standard of the Turkey Trot. I tried running eight miles on Monday, Oct. 5, and I made it. I also made it that Wednesday and Friday. Not thinking this was sustainable, I played with the idea of running a shorter distance more often. So the following week I ran six miles over five straight days. While I actually ran out of gas after four miles on the fifth day, I finally had to admit that, yes, I am a runner. And maybe even a half-marathon runner. I Googled “half marathon Dallas” and discovered plenty were coming up. Then my eyes landed on one that seemed too good to be true: the day before my birthday, with the same start/finish as the March of Dimes walks we’ve been doing for more than a decade. There was still one niggling concern: I hadn't trained. At least, not formally. I Googled "half marathon training" to see how far behind I was on a master plan. Based on the miles I’d logged the last two weeks, I actually was way ahead of schedule. My crazy, aimless training scheme made me quite ready. I jumped into a training program at Week 10 of a 12-week program. I also started learning about preparing for a race, including what to eat. I realized that you can’t aim to lose weight and prepare for a half marathon at the same time. Not that I was going to start scarfing Twinkies. But I did need to tweak my diet for about 10 days. First, I wanted one last weigh-in. Wow. I celebrated with another round of new jeans: 30s, a size I certainly haven’t worn since college, maybe high school. Race day got off to an ominous start when my shuttle bus driver got lost in the short distance between the parking lot and the drop-off point. In the starting area, I debated whether to hang with the people aiming to finish in 2:20 or 2:25. A drop in confidence sent me out with the 2:25ers, but after one mile I got right behind the woman holding the 2:20 sign. I blew by her during mile 5, feeling fresher than I had at the start. I’ll spare you more play-by-play, except to note that my first mile was my slowest, my 13th mile was my fastest. The final 0.1 to the finish was pure bliss. I finished 907th out of 1,512 – much closer to the middle than the end. Finishing was my goal, not a particular time. Still, this beat my most optimistic expectations. Lori was there to watch me cross the finish. At home, my three boys greeted me with a silly-string shower. According to my Fitibit, Sunday was my best day ever with 32,637 steps. 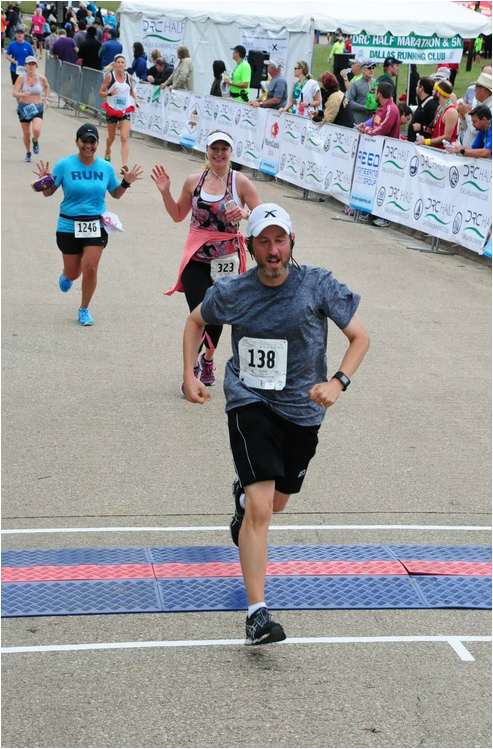 So now I’m 45 and … yes … a runner. As a member of the Dallas Racing Club, I’m signed up for eight events in 2016. I’ll also be doing the Turkey Trot on Thanksgiving – doing the 8-mile loop again, only this time running. I’m not sure what’s next in this journey, but I know there will be a next. I like knowing that. I often tell my kids that I regret never having worked out in high school and college; sad truth is, I shunned it. I needed another 20 years before it finally clicked. But it did, and that's what matters. I’m sharing all this mainly because it’s what I do. I’m a writer and a big part of my professional life is writing “survivor stories.” Essentially, that’s what this is. Thanks for indulging me by having read this far. I don’t recommend my way of doing things for anyone else. But I do believe one aspect is universal. Motivation. You’re not going to accomplish anything (that is, set a plan and stick to it) until it matters to you. We all try various things and when they don’t pan out, we get frustrated. Odds are, your head was in it but not your heart, or vice versa. When everything falls into place – when you are consciously and subconsciously committed to a goal – cool things happen. One step forward leads to another. And another. For me, all those steps led to a half-marathon finish line. While you're here, I hope you check out the rest of JaimeAron.com.